The following settings are available from the Pro/Engineer Import Options dialog. Click the RESET button to restore all the settings in this dialog to their default configuration. When you have finished making your selections in the dialog box, click OK. 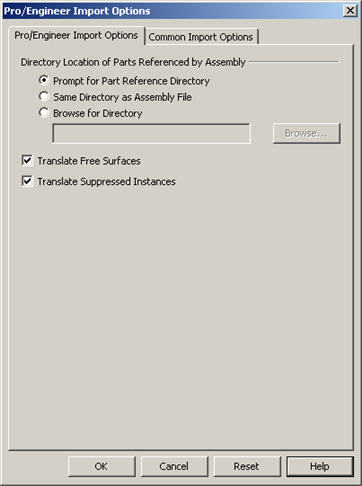 Translate Free Surfaces - If selected, KeyCreator translates any free surfaces. Otherwise, it does not. Translate Suppressed Surfaces - If selected, KeyCreator translates any suppressed surfaces. Otherwise, it does not.